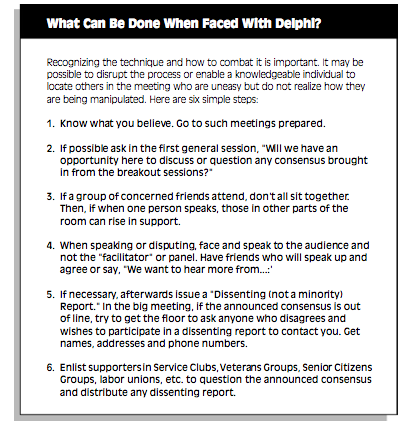 The original survey technique has been adapted for use in controlling and manipulating meetings or study groups called to get public input for issues in education, police community relations, state control of child care, etc. Bachmann, as far as I can tell, never discussed Delphi directly. But it was a pretty integral aspect of the MREC’s push against the Profile of Learning, the Minnesota curriculum standard that launched Bachmann’s career in public life. Beginning in 1998, she criss-crossed the state on behalf of the group and maintained close ties with the MREC during her time as a state Senator in St. Paul. In hearings as a state Senator Bachmann used her platform to push the Agenda 21 conspiracy in a fashion that would have fit in at the Georgia state capitol; she once questioned a panel of professors on whether they supported population controls or intended to ban humans from living in certain areas. She also fretted that the United Nations definition of sustainable development would lead to a moratorium on light bulb production. In early November, Bachmann scored the narrowest re-election victory of her congressional career despite the fact that her district became more conservative after redistricting. She held off a challenge from Democrat Jim Graves by just one point—in a district that Mitt Romney won by 15. Raving against sustainable development helped launch Bachmann’s career, but if this month’s election results are any indication, her frequently conspiratorial warnings may also be what eventually brings it to an end.